In 2003 Great Oak finished construction to be the second Cohousing community in Michigan, and Ann Arbor. We are 37 households, ranging from young families to retired couples. We have about 65 adults and around 35 kids. Cohousing is a form of collaborative housing that offers residents an old-fashioned sense of neighborhood. In cohousing, residents know their neighbors very well, and there is a strong sense of community that is absent in contemporary cities and suburbs. 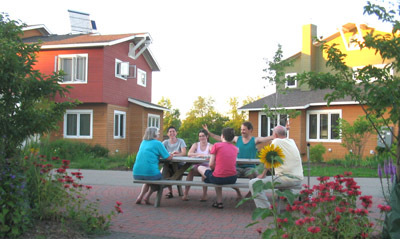 Cohousing communities consist of private, fully-equipped condominiums and extensive common amenities including a community building (or "common house") and recreation areas. They are designed and managed by the residents who have chosen to live in a close-knit neighborhood that seeks a heathy blend of privacy and community. 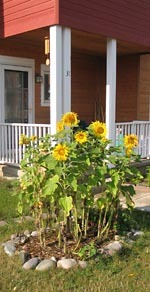 Tours of the three Ann Arbor Cohousing communities are held on Sundays at 2pm or by appointment. We meet at 2pm at Sunward Cohousing, 424 Little Lake Drive, Ann Arbor, MI 48103, just inside the common house (green building, door off the parking lot). Tours will include information and discussion about cohousing, followed by a walking tour of all three communities (Sunward, Great Oak and Touchstone). Tours usually are 1 1/2 - 2 hrs in length. What does Great Oak Cohousing offer? Located in the Ann Arbor School District (elementary: Haisley, middle school: Forsythe, and high school: Skyline), with various private and charter schools to choose from.